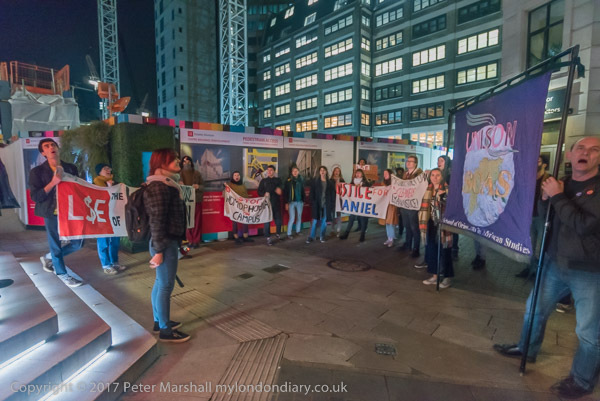 During the successful campaign to get the LSE cleaners the London Living wage, another problem affecting one of the cleaners emerged and was taken up by his union, the United Voices of the World. 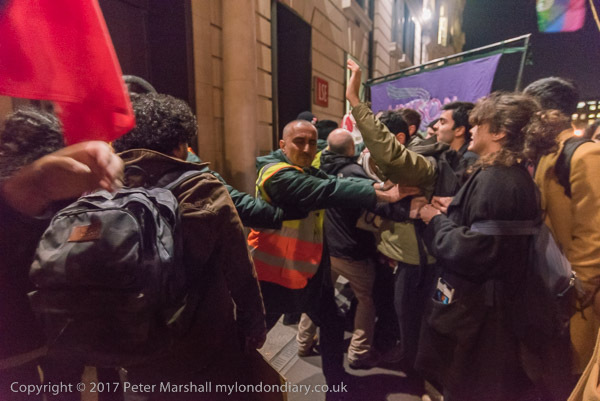 The UVW made complaints about to both the LSE where the cleaners work and the direct employer, Noonan, about the continual harassment suffered at work by Daniel Gichia, the first Kenyan man to marry another man, because of his homosexuality. Apparently part of the deep industry expertise is in allowing what the UVW describe as “vile, homophobic harassment” and they say both Noonan and the LSE have always stubbornly and callously refused to take any action against Daniel’s harassers, despite admitting that some of his compliants were true. The UVW took his case against Noonan to an employment tribunal, but the harassment was continuing. 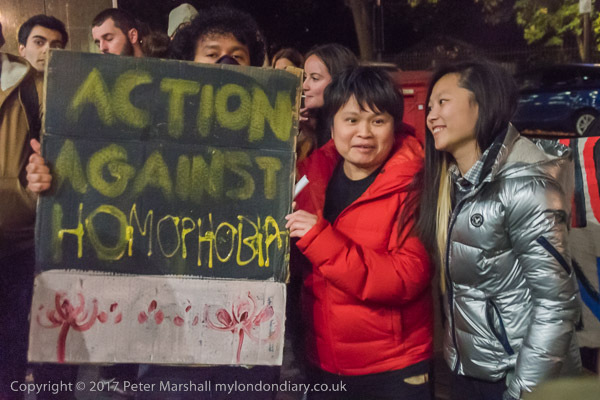 The protest took place at the time when the LSE as hosting as hosting a talk, “LGBT Rights: what next?”, which the protesters felt was hypocritical when the LSE was refusing to take action – or pressure its contractor to act – over a clear case of discrimination on grounds of homosexuality taking place in its institution. 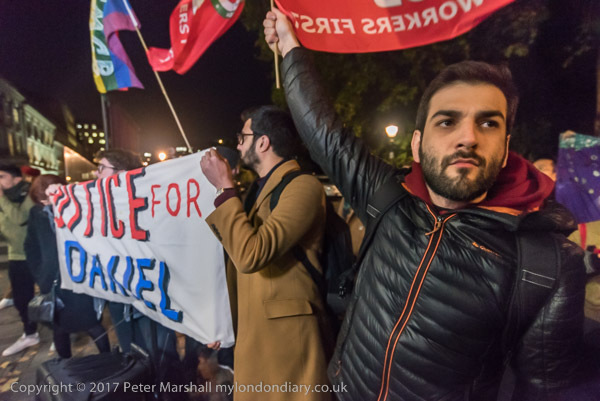 A few days before this post was published, the employment tribunal eventuually published its decision, finding Daniel was harassed on multiple occasions at the LSE merely for being homosexual, finding that he was told that “homosexuals were not human”, and that he should “sleep with women to cure his problem”. 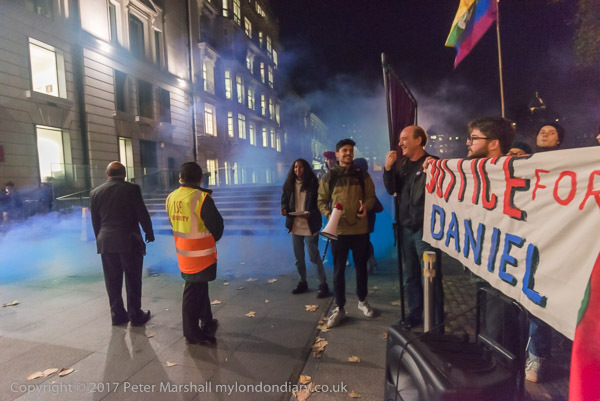 As well as this personal victory for Daniel, the tribunal also found that that there existed at the LSE a culture whereby it was acceptable to make such comments, and that Daniel was called “a woman” for having raised his grievance in the first place. Clearly the LSE management now has to take seriously the standards the institution has long stood for and used in its own promotion and apply them in its own practices. Photographically the main problem was lighting. The area around the back of the building where the protest began was very badly lit. For most of the pictures there I used the cheap LED light source, the Neewer CN-216. It doesn’t have a huge light output, and, run from 6 AA cells the output falls off fairly rapidly after a few minutes of use. It’s best to keep switching it of after taking a picture, but that slows you down as you have to put it back on for the next. I’m only gradually becoming used to using very high ISO on such occasions, and while it would have been better to have taken most of these pictures at ISO 12,800 there are quite a few at much lower ISO. And a few at 12,800 were still seriously underexposed, which isn’t a good idea. Almost every image was made with lenses wide open, and shutter speeds varying from around 1/30s to 1/100s, sometimes not fast enough when people were moving. This entry was posted on Monday, April 16th, 2018 at 09:19 am and is filed under My Own Work, Political Issues. You can follow any responses to this entry through the RSS 2.0 feed. You can leave a response, or trackback from your own site.